The pressure on the points of passage is incredible, smugglers are controlling most points of passage and fighting other smugglers, or people who are simply trying to pass without paying. The ‘free’ points of passage are very few, they are closed by tall fences and guarded by very violent police, and people are so desperate they are fighting each other for access to the motorway – it is unclear if there are gangs or established smugglers networks trying to take control of these ‘free’ crossing points. What is evident is that fights occur on the lines of different nationalities and ethnic groups. It is the effect of closing the border: people run on the motorway in their hundreds, clashing with each other and with the police; putting their lives at risk – we never had so many deaths and injuries at the Calais border; causing hazard to lorry drivers and passing vehicles – but no lorry driver has died so far! The BBC has captured some of the action. The ‘analysis’ of this BBC journalist is clearly totally baseless, the weapons are actually bits of wood and the people identified as ‘traffickers’ could be anybody! It is self-evident that the eviction of the South side of the ‘jungle’ has been totally useless in reducing numbers – instead problems in the camp and tensions between communities have greatly increased with the overcrowding, and the place is like a ‘pressure cooker’ as volunteers from associations aptly put it. It is said everywhere that numbers of people in the ‘jungle’ are higher than ever. I am not sure. At the end of last summer there were about the same numbers if not more, though no count was made at that time and it is just my impression, and the impression of volunteers who were giving tents and blankets to newly arrived people: they were saying numbers may have been close to 10.000, same as now; with the difference people arriving now are more numerous than last year, on average… and now they are crammed in less than 1/3 of the original size of the ‘jungle’. Up to 100 new people arrive per day, which causes no little problems. Demographics have chenged again and the Sudanese are again the most numerous group – until short ago the most numerous were the Afghans. All desperate to get out that horrid place, trapped by the fence provided by the UK government, hurt by French poolice who use truncheons and gas even on women and children and fire gas grenades and rubber bullets directly into the crowd, and threatened by smugglers if they stray into their ‘territory’. Smugglers’ networks have been greatly reinforced as a result of the border’s closure, prices have gone up, and the police themselves are saying they never arrested so many smugglers – but they are only catching small fish, not dismantling any networks. Independent and semi-independent smuggles who are generally nice to people and do not ask for too much money tend to be replaced by proper mafia men who are very violent, armed to the teeth with guns, knives and gas, some are known to abuse women and children. Yet the biggest criminals are those who are responsible for this situation, who have been forcing thousands of refugees to live in inhumane conditions and pushed them into the hands of the mafia: such as bernard cazeneuve, manuel valls, françois hollande, the british government (cameron first and now theresa may), and the european union. What is most worrying and sad is that borders are closing everywhere in europe (this is not Europe as I have known it) and the Calais model is being exported, massively. 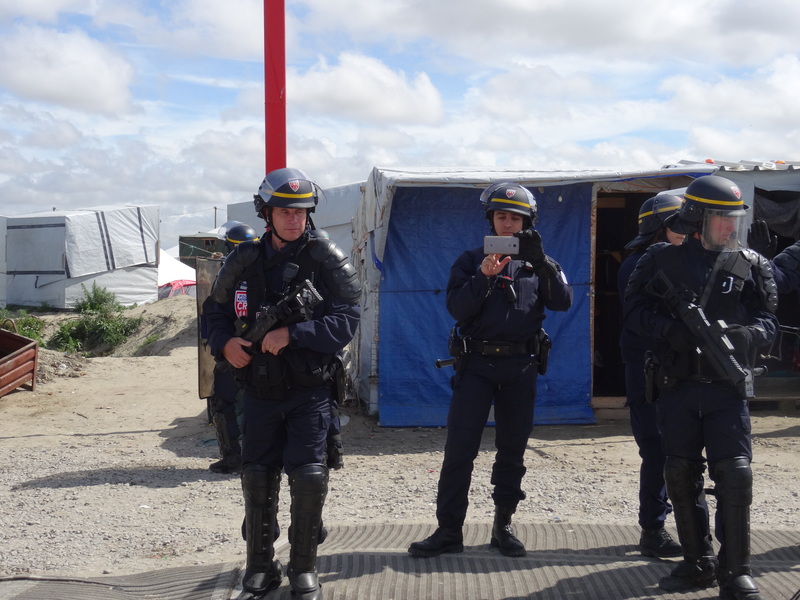 There are currently over 1600 riot police present in Calais (previoulsly were 1300). Earlier this year, not long after the eviction of the South side, a large portion of the North side was destroyed by fire in a huge fight that opposed Afghans, Kurds and generally light skinned people against Africans. The police did nothing but throwing gas on the camp from a distance, causing more fire, and they targeted exclusively the Africans. The day after, the (real) community leaders met and brokered the peace, and everybody did their part to prevent further fighting. The Holy month of Ramadan was very peaceful, the Afghans and the Sudanese prayed together in the Mosque. 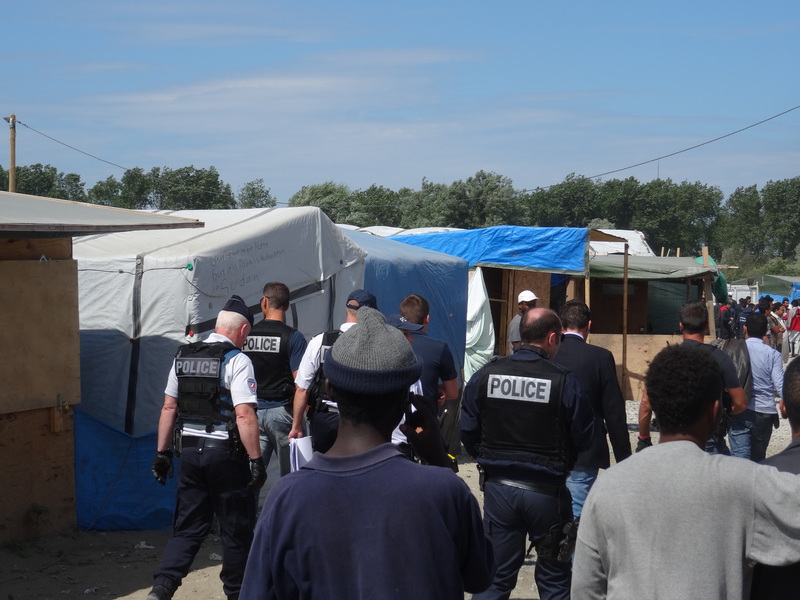 The worst fights happened in 2014, following a massive and sudden increase in numbers of people stranded in Calais and competition on the points of passage. The situation seems to be repeating now! I copy below what I wrote at the time, edited for shortness and with link to the full article. All jungles and squats mentioned in the post have been evicted and all people forced to move near the Jules-Ferry centre. Since the big and sudden influx of immigrants in 2014 there were high tensions between different communities, problems with alcohol and drunken fights, and fights over scarce resources that could become very violent. Migrants have been progressively pushed out of town, despite some remarkable resistance, including occupations, protests and a hunger strike. The Jules-Ferry centre seems the ultimate achievement in rendering migrant people invisible, cast out society and exposed to violence by police, racists and others. It is close to smugglers’ territory– not all smugglers are bad but some are, and on the way to lorry parks that have been the theatre of very violent fights, resulting in several people hospitalized. These fights can sometimes continue for days, involve hundreds of people and expand to the camps where people are sleeping. During the year 2014 we had the worst fights ever. Several people were hospitalized with knife wounds, some almost lethal, and broken bones, after big fights of Egyptians, Sudanese and Albanians against Afghans – everybody wants to take the lorry park of the Afghans, that is defended by a gang of violent smugglers armed with guns, knives and CS gas; these smugglers also hurt other Afghans who try to cross, or simply want to sleep in places controlled by them without paying; they are very different from other Afghan smugglers ( from 2009 to 2013), who were mostly nice guys, would defend their territory from other smugglers but caused no problems otherwise, and were kind to their own people. 64 African people were hospitalized after two days of big fights between Sudanese and Eritreans, four in serious condition; these fights originated over the control of another lorry park, when the Sudanese wanted to stop the Eritreans from going there. Three days of battles between Eritreans and Ethiopians ensued after the Eritreans told the Ethiopians not to go any more to a parking they were using: I saw 400 people throwing stones at each other and running after their rivals armed with metal bars, just outside Tioxide jungle; the police managed to break that fight, and I must say they behaved well on that occasion, at least they did not use excessive force. The Eritreans told the Ethiopians to leave Tioxide and destroyed their tents; 50 Ethiopian and Eritrean women, children and some teenage boys went to sleep in the squat Galloo because they were afraid, or in the women’s house. It took time to bring peace between the two communities. More recently, there was a night time attack by Sudanese on innocent Afghans who were sleeping in bois Debruille, and have nothing to do with the smugglers – they moved there precisely to get away from their control. Several tents were slashed with knives including tents where some minors were sleeping. The Afghans reacted and beat the Sudanese up really bad. Afterwards, they brought the casualties to the road for the police and ambulances to collect them: one had a broken leg, another a head wound; one Afghan was also hospitalized, many escaped with minor injuries. The Afghans say they do not like doing things like that, but if attacked they defend themselves. I hope I did not give a bad impression of the Sudanese, most of whom are very nice people, only a minority are crazy. The authorities know all this has been happening, but they do not care putting people in danger. There are hunters shooting wild game near the J-F centre, and they do not want the migrants there. Questo articolo è stato pubblicato in Senza categoria il 26 agosto 2016 da EXODUS - watchtheborders. Questo articolo è stato pubblicato in Senza categoria il 13 agosto 2016 da EXODUS - watchtheborders. The refugees selling food and goods accused of causing hazard e.g. fires and trouble to public order. 72 business between restaurants, shops and hamams (showers with barber shops) are threatened closure and/or demolition and the owners – or those identified as that – threatened to be evicted and the makeshift buildings that host the restaurants destroyed !!! Please come in front of the tribunal and support! Legal defence is being organized. 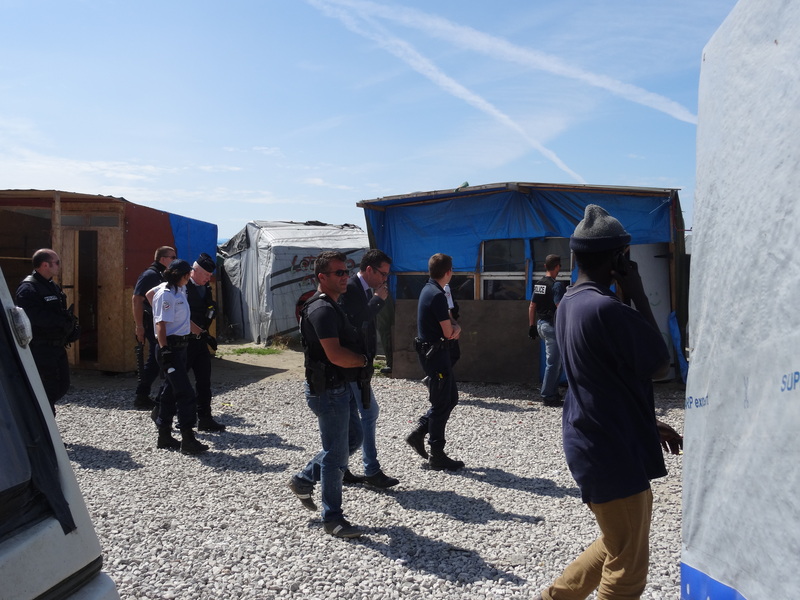 Patrick Visser-Bourdon (in the centre, wearing glasses, suit and tie) is the temporary head of Calais central police station and in charge of this ‘humanitarian’ operation of stealing food from refugees and children. The associations have signed a press release, saying the closure of the restaurants threatens the food security of the camp’s inhabitants, as neither La vie active who manage the centre Jules-Ferry, nor the independent kitchen combined have the capacity to feed all the people – though La vie active could serve more meals, they are currently serving up to 3500 once a day only. Volunteers from the kitchens are saying since the closure of the restaurants the queues are much longer, and they can no longer feed everyone. The centre Jules-Ferry only provides one meal per day for 3500 people at present, the queue lasts up to 4 hours! People do not have enough plugs to charge phones, nor enough showers. The restaurants distributed food covering 20% of the camp’s needs. The camp kitchens 40% : Kitchen in Calais 1000 free meals per day, Belgian Kitchen 1000, Refugee Community Kitchen (Auberge des migrants) 2000, Ashram Kitchen 800, Kid’s Restaurant 200. Please donate to the kitchens, and also to the restaurants and shops affected. Dozens of people were making a living from the restaurants, in the absence of any other prospect of employment they created their own autonomous activity, making a little living for themselves, sending money to their families, doing a great service to the community and employing other people too! Far from being a risk hazard, the restaurants and shops provided some security, there was someone to look on the streets at all times, many fights and assaults were stopped, and several fires in the camp put down. The businesses were full of people at all time, charging their phone, meeting their friends, sheltering from the rain etc. Licensed shops are very far, the shanty town being 7 km from the town centre. The restaurants also provided some accommodation at night and were somewhere new people arriving could turn to for help and directions. When the restaurants are closed the streets are dark and empty and there is no one to look out! Questo articolo è stato pubblicato in Senza categoria il 5 agosto 2016 da EXODUS - watchtheborders. After a relentless hunt, come support the refugeEs Saturday 6 August at 15h at JAURES! Après une traque incessante, venez soutenir les réfugié.e.s SAMEDI 6 AOUT à 15h à JAURES! The funeral of Mubarak Ibrahim, killed on the motorway by an unidentified vehicle, took place yesterday in Calais North cemetery, Over 200 people attended, mostly from the Sudanese community but also other migrant communities, volunteers from associations, local anti-racists and international activists from the No Borders network. The report is based on evidence collected in March. We welcome the report and would like another one, though pessimistic the police will follow any recommendations. To our knowledge police violence has gone up since, appallingly, especially when people go to try to get on the motorway or Eurostar: it is common practice for the police to move them by spraying them in the eyes, women and children included, and hitting them with truncheons but punitive beatings of people who have been caught are also commonplace. Particularly worrying is that the police are firing gas grenades and rubber bullets directly at people including underage boys: a 17 years old from Afghanistan was shot in the head and taken to Lille hospital in serious condition, and an Eritrean boy had his eye socket blown off; plus many other horrendous facial injuries, plus injuries to arms, torso, limbs. Two volunteers (other than the volunteer mentioned in this report) were shot at, one hit on the shoulder. It is also commonplace for the police to hit people including women and minors on the head with truncheons, and many have broken fingers and sprained wrists. One man had an arm broken in several pieces and had to undergo an operation, he is still numb and cannot move some of his fingers; it is not clear in his case if it was the police or a paramilitary militia, probably police. Others had broken legs and dislocated ankles as a result of their encounters with police, but there have been at least 5 recent fascist attacks that we know of, they do not behave very differently. Questo articolo è stato pubblicato in Senza categoria il 3 agosto 2016 da EXODUS - watchtheborders.